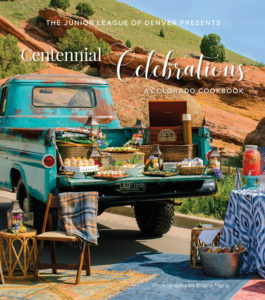 Packed with the colorful flavors of the Centennial State and honoring JLD’s 100th anniversary, Centennial Celebrations includes more than 200 thoughtfully selected and thoroughly tested recipes for every season and occasion. The creative menus, recipes, and entertaining tips will inspire you to cook, connect, and celebrate…Colorado style! A goldmine of recipes from the Junior League of Denver! This treasure trove of recipes reflects Colorado’s casual style of living, rich heritage and natural bounty. Includes 680 recipes that are upscale, yet uncomplicated, inspiring, yet reliable, in the tradition of great American cooking. 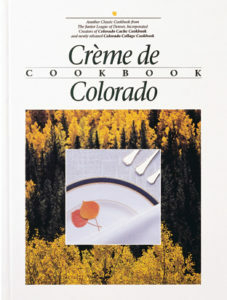 Colorado Cache is the first in a collection of five famous and award-winning Colorado cookbooks. The name says it best! This bestselling community cookbook has 700 recipes representing the best of Colorado cooking, reaching beyond the realm of the ordinary cookbook. Readers enjoy 15 sections of scrumptious recipes ranging from Wild Duck Gumbo to sensational Chicken Fajitas. The hardback version has been a smash since its publication. Color images, by Colorado naturalist photographer John Fielder, make the book a true showpiece, as well as an indispensable kitchen aide. 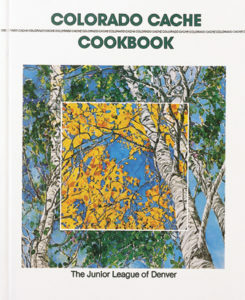 Colorado Collage is a wonderful, historical collection of more than 500 recipes that are true to Colorado. Highlighting the delicacies around us, from fresh rainbow trout to fruits grown in the orchards of the Western Slope, enjoyed over and over again by those who have lived in Colorado. Celebrate the rugged individualism and unique, healthful ingredients that epitomize the West. 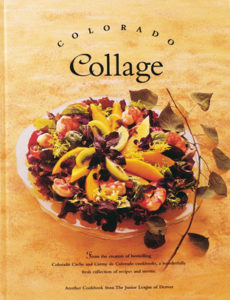 Colorado Collage is a regional ethnic American cookbook with unique cuisine. 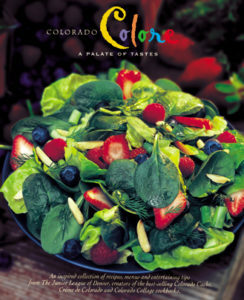 Colorado Colore is a selection of more than 300 recipes designed to be artfully inspiring, yet uncomplicated and accessible. The exciting tapestry of flavors and richly hued visual presentations of Colorado Colore have been chosen to offer a taste of the state’s diverse cultural influences and bounty of colorful ingredients. Throughout the pages you will find recipes as visually delightful as they are appetizing. Savor the colors, flavors, and memorable theme-style menus with suggested wine pairings plus an entire section devoted solely to vegetarian fare. 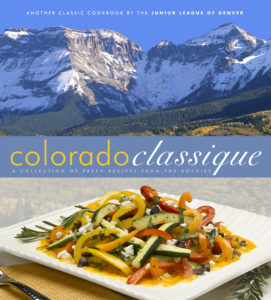 Colorado Classique features a collection of recipes from the casual Apres Ski Beans to the elegant Truffled Gnocchi, beautiful photography, and a Colorado restaurant chapter. Classique introduces beer flavor profiles provided by Boulder Beer Company, Colorado’s first microbrewery. You’ll learn whether a pilsner or a malt would be the perfect match for your meal. If you prefer wine, The Vineyard Wine Shop has provided wine pairing suggestions including details about why a particular wine will compliment your recipe. The book is certified environmentally conscious by the Forest Stewardship Council. Can’t get enough of the JLD Cookbooks? Check out our blog!